Ana Ivanovic may have become a mother not very long ago, but that apparently hasn’t affected her modelesque figure. 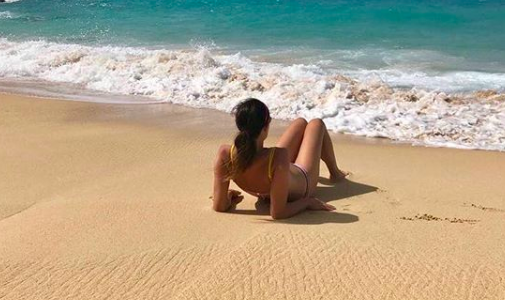 The retired Serbian tennis star, who welcomed a baby boy with husband Bastian Schweinsteiger in March this year, relaxed on the beach as she took to her official Instagram account to share a picture of herself. “Dreaming of the [beach] and some [sun],” she wrote the caption to her 1.5 million followers. And boy, Ivanovic, 30, looked absolutely stunning as she soaked up the sun wearing a skimpy bikini. This wasn’t the only picture that showed how big a fitness freak she is. A few days back, the former French Open champion stretched it out during a promotional event in Portland. Sure she’s giving post-baby body goals to many!